Reading further, he learned that the Espresso Book Machine had access to 1.6 million titles via the company’s encrypted network, Espressnet, and that it had made Time magazine’s “Best Inventions of 2007” list. A few weeks later, the couple placed an order for the veritable nouveau printing press, which is scheduled to arrive at their store in early December. Since early September, Scott has been giving weekly seminars to community members about the opportunities the machine will create for self-publishing and how it will change the way we buy books. “Authors around here are just drooling,” he says. Readers should be, too. On Demand Books announced in September that it had made a deal with Google granting any outlet with an Espresso Book Machine access to the two million volumes on Google Books. Espressnet can also print from the digital library of Lightning Source, a book distributor that stocks and prints millions of current and back-listed volumes for publishing companies. That brings Espressnet’s total stock up to five million books. Beck likens the machine to a one-million-square-foot warehouse in the footprint of a high-speed copier. Only seven Espressos can currently be found in bookstores in the United States, plus a handful in university libraries. In January 2008, the Northshire Bookstore in Manchester became the first independent bookstore in the U.S. to have one. At around the same time, Northshire created a subsidiary publishing company, Shires Press, which offers editing, design and publishing services to authors from all over the country. The Becks have created their own version, Railroad Street Press. “We’ve had great luck with self-published authors,” explains Debbi Wraga, the print-on-demand coordinator at the Northshire. She attributes that to the personal service Shires Press can provide, in contrast to self-publishing websites such as Lulu, CreateSpace and BookSurge, which force authors to birth their works through a computer interface instead of a real human being. And, unlike many online services, Shires has no minimum order requirement. 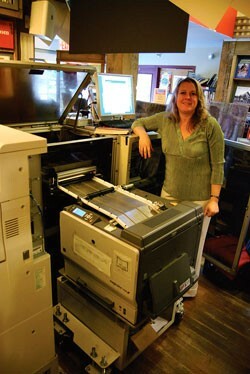 With the Espresso Book Machine, an author can print just one book or hundreds at a time. Priced on a sliding scale — the more pages, the less each costs — the average book costs $6; a 200-page tome is $10. And Wraga, who has a background in graphic design, can help design the cover and layout, obtain an ISBN number that allows the book to be sold in retail stores, and apply for a Library of Congress number. The full menu of services ranges in price from $69 to $599. All of that appealed to Bruce Sargent, 66, a retired teacher from Montpelier who wrote a book about how to build a yurt for less than $1000. At first, he considered using a printer in China, but then a friend urged him to go local. He Googled “print books Vermont” and found the Northshire. “I just smiled inside,” he says, “because I know the owners of the bookstore, and their integrity is incredible.” Sargent’s book came out a few weeks ago and is available on his website, at Amazon.com and at Northshire. He’s sold about 15 copies so far (at $19.95 for the paperback; $12.95 for the electronic version), which he believes is a good start. “It’s really fun selling books in your sleep,” he notes. The road to self-publishing was a little different for Judith Schwartz, 48, a freelance journalist and editor from Bennington. She had written a memoir of her experiences training to be a psychoanalyst, and even found an agent to represent her. The book never sold, but Schwartz was convinced the publishing industry couldn’t be trusted to weed out the truly good ideas from the bad. “I had to ask myself,” she remembers, “Why am I letting my writing career be dictated by a broken system?” Then she heard about the Northshire’s book machine. In July, Schwartz published her memoir, The Therapist’s New Clothes. While the Espresso gives booksellers publishing power, Espressnet could help them compete with online sellers in the new paperback market. Northshire doesn’t yet have the Espressnet software, but when it gets an update this spring, Wraga predicts, about a quarter of the Espresso business will come from customers who want to buy titles that aren’t on the shelves. Northshire Bookstore, 362-2200; Boxcar & Caboose, 748-3551.